Looking for lightweight body and great smelling hair on those days when washing isn't an option? Then Herbal Essences Bio:Renew Dry Shampoo is bound to be your new best friend - it instantly absorbs oil and boosts scent for a waterless wash that leaves no excess residue. with the scent of fresh squeezed citrus followed by clean mint and velvety peach. 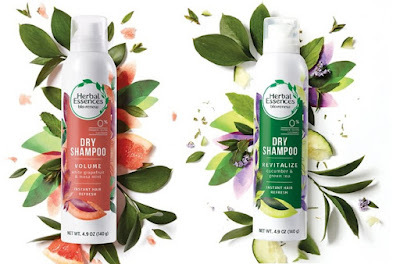 Herbal Essences Bio:Renew Revitalize Cucumber and Green Tea Dry Shampoo - 140g - $9.99 - with the scent of green leaves followed by delicate water lilies and clean amber. It's simple to use, just shake first then spray on hair, working into roots - then brush out and style as desired.